Crushing his own course record by 43 seconds, Lincoln High track star Jacob Slupecki successfully defended his 2011 championship at the third annual Schools Stomping Out Type 2 Diabetes 5K in Tom Brown Park on Saturday morning, 25 February 2012. Slupecki's 16:47 put him across the finish line over 600 meters ahead of the runner up, Peter Kaus, who ran 19:12. Right on Kaus' heels and closing was Sheryl Rosen, the first female finisher, placing third in 19:13. Florida A & M University philosophy professor Michael LaBossiere was the fastest master runner in the race, finishing fifth overall in19:35. The top woman master that morning was Marietta Colberg, 21st in 22:32. The Schools Stomping Out Type 2 Diabetes event was an entire carnival, almost as big as the length of its name. Other activities besides the 5K included mountain bike races, a one-mile fun run, Zumba, music, and kickball. The 5K race, though, was the first event of the morning, scheduled for an 8:30am start. 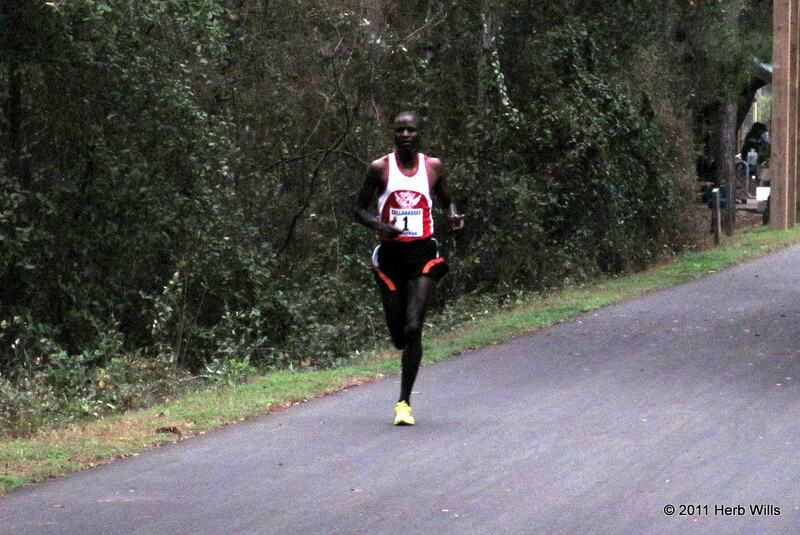 Slupecki bolted into the lead almost immediately. After 800 meters he was already 50 meters ahead and continuing to pull away. Behind him, Peter Kaus and Hunter Scott vied for second. Kaus had been the 2011 Diabetes 5K runner up, and Scott is one of Slupecki's teammates at Lincoln High. Scott broke contact with Kaus, leading the latter by forty meters halfway through the race. During the second half of the race, though, Scott dropped out, leaving Kaus alone in second, and at times 200 meters ahead of the next runner. Slupecki went on to win in a course record 16:47. Kaus was almost caught, but hung on to the runner-up spot, a few steps ahead of Sheryl Rosen. Michael Kennett was fourth in 19:20. The women's entries included 2011's defending champion, Kelly Stevens, but it also included Sheryl Rosen. The two ran together during the first mile, leading the women's field. By halfway through the race, though, Rosen had slipped ahead of Stevens, opening up a three-second gap. The second half of the race was all Rosen's, as she continued to increase her margin over Stevens. Rosen's winning time of 19:13 set a new course record for women, breaking the old record of 19:17 set in 2010 by Shannon Coates. Stevens was the next woman across the finish line, placing sixth overall in 19:36. Slupecki's 16:47 and Rosen's 19:13 were not the only records established at the 2012 Schools Stomping Out Type 2 Diabetes 5K. The 257 finishers in the race was also a new record for the event. The Diabetes 5K just might outgrow Tom Brown Park's Goose Pond Trail one of these years. 2011 story, "Slupecki and Stevens stomp to victory in Tom Brown Park"
2010 story, "Black and Coates stomp the competition"
The second half of the Tomato Trot 5K belonged to Lindsay Zeiler on Sunday, 19 February 2012, as did victory in that race through Tallahassee's Southwood community. The former Southeast Missouri State University Redhawk track star won the second annual race in 19:22, finishing over 400 meters ahead of the runner-up, Lincoln High junior Jonathan Grisiaffi. Grisiaffi covered the course in 21:19. The race started near John Paul II Catholic High School just after 11:00am. Grisiaffi bolted away from the rest of the field as the runners fought a stiff breeze on Shumard Oak Boulevard. He was well out ahead by the end of the first kilometer, but Zeiler was in second, stalking him. By the end of the second kilometer, where the course climbed Merchants Row Boulevard toward the Southwood town center, Zeiler had closed the gap on Grisiaffi. Zeiler took command during the third kilometer, and spent the second half of the race running away from Grisiaffi. The Tomato Trot 5K was the first event in the second day of the 2012 Italian Family Festival, held on the grounds of John Paul II High School. Looking for another vegetable themed race in the Tallahassee region? Look here! Maclay School assistant track coach Stephen Cox stole the lead from Wakulla High distance runner Stanley Linton during the tenth kilometer of the Flash 12K, then went on to win the 24th annual race in 41:23. 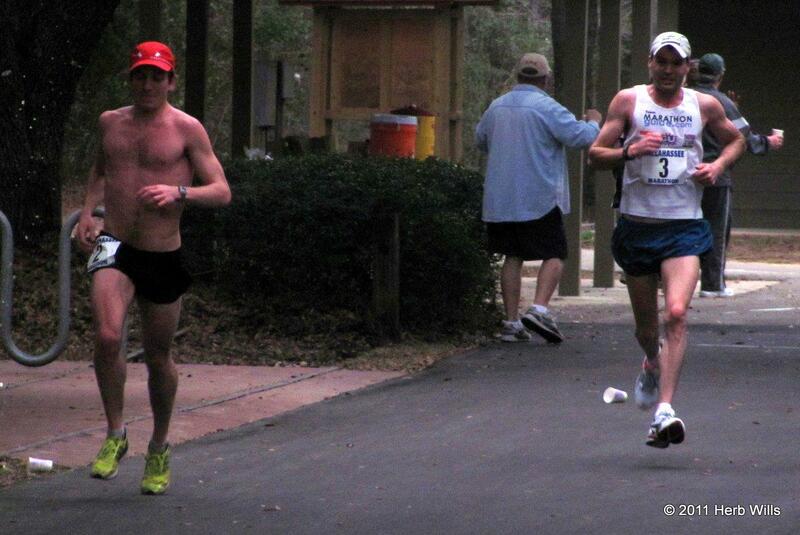 Gary Droze, the head track coach at Maclay, was the fastest master runner in the 12K, placing third overall in 42:45. Tallahassee's Katie Showman took top female honors in the race with a 49:52, while Thomasville's Mary Anne Grayson ran 51:46 to finish as the first female master. 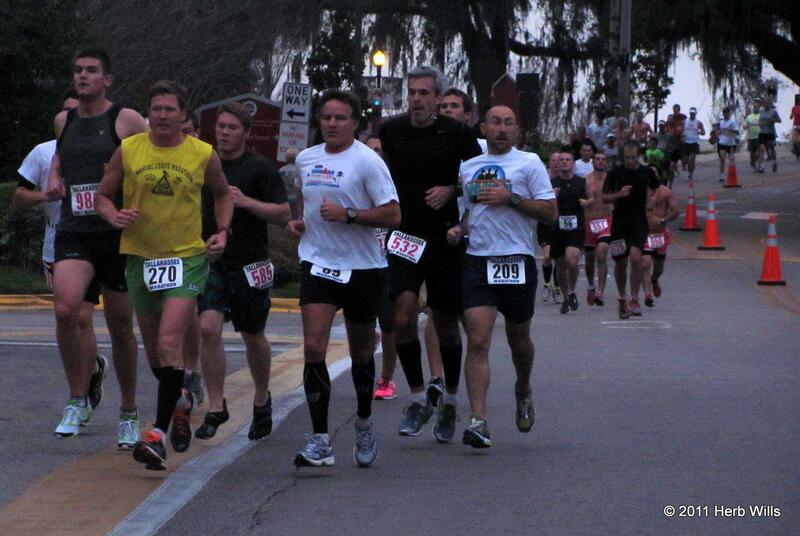 214 athletes completed the race, held Saturday, Feb. 18 in St. Marks. It was the second year in a row that St. Marks was the site for the Flash 12K, after a long history of the race being run first in Chaires and later in Woodville. Swarms of hungry no-see-ums greeted the runners that morning as they assembled near the starting line in front of Fort San Marcos de Apalachee. "It's kind of a weird distance," commented one of the runners. Yes and no. You certainly won't see as many 12K as 5K events on the weekend road racing circuit, but 12K is the official distance for the world cross-country championships. For those of us who never quite switched over to metrics, it works out to almost exactly seven-and-a-half miles. Some minutes after the scheduled 8:30am, the race got under way. Maclay coach Gary Droze led the initial charge off the starting line, but before the end of the first kilometer Stanley Linton was out in front. Just four days earlier, Linton had opened his senior year track season with wins in both the 1600 (4:48.34) and the 3200 (10:20.03) at a track meet at Rickards High School. In this longer race he led the field through the streets of St. Marks and onto the Tallahassee-St. Marks Rail Trail. By midway through the third kilometer, Linton was 20 seconds up on Droze, with Stephen Cox another five seconds back in third. For a while Linton's lead grew, but during the second half of the race Cox accelerated. Linton didn't. Cox moved past Droze into second and started chasing down Linton. At nine kilometers, Cox pulled even with the Wakulla High senior. After a brief battle, Cox was the front runner. He spent the last two kilometers running away from the field, finishing the race over 200 meters ahead in 41:23. Linton was runner-up in 42:13, with Droze another 150 meters back in 42:45. Like Linton, in the women's competition Katie Showman went to the front early. By the third kilometer, a group of four runners was chasing Showman--Kristine Cox, Micah Adriani, Mary Anne Grayson, and Flash 12K defending champion Kelly Stevens. Cox dropped out of the pursuit group and Showman continued to pull away, making it look like Adriani, Stevens, and Grayson were going to be fighting for second. Showman crossed the finish line in 49:52, close to 200 meters ahead of Kelly Stevens, who had fought free of Adriani and Grayson to take the runner-up spot in 50:38. Grayson was closing on Adriani on the homestretch, but Adriani hung on to take third, 51:40 to 51:46. 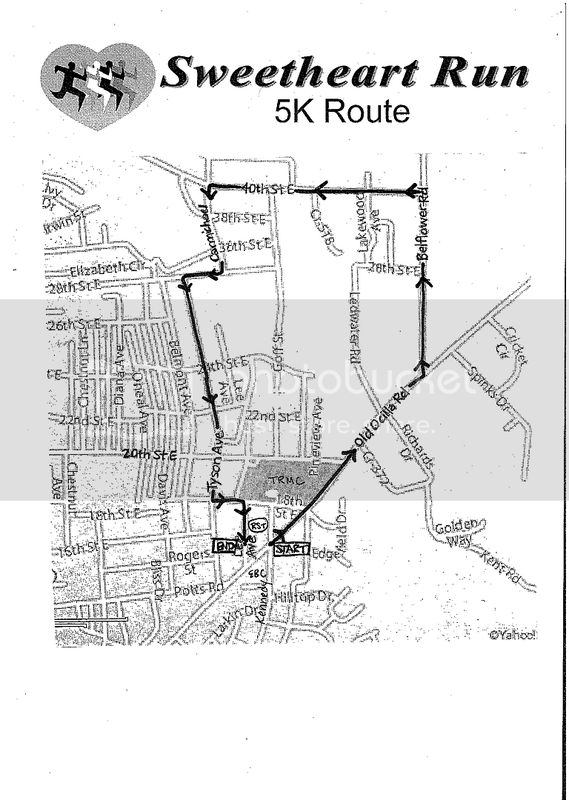 In 1989-2004 the race started and finished in Chaires. 89 runners finished the 6K race that was run concurrently with the 12K. Duane Evans of Crawfordville, Florida was the fastest overall finisher in the shorter race as well as the top master, finishing about half a kilometer ahead of his nearest challenger in 24:57. Tallahassee's Nancy Gribble was the first female and the first female master in the 6K, placing fourth overall in 27:39. 2010 story, "Lee and Rosen Flash to the Front"
Last year Gulf Winds Track Club's annual Tallahassee Marathon had to leave the St. Marks Trail because of construction. It was like having to evacuate a home for a natural disaster. Sure, the marathon goes back to 1975, and it has only been held on the St. Marks Trail since 2004, but that was enough time for the trail to seem like home. So it was a homecoming of sorts when the event returned to the trail last Sunday, Feb. 5, for the 38th annual running. Last year's course through Southwood was nice, but it was good to be back. That the trail had been renovated, repaved, and widened was a bonus. Not that many of the over 300 athletes entered in the marathon would have necessarily recognized the course. Less than half of the runners were from Tallahassee, and several of those would have been running their first 26.2-mile race. The majority of the field was from out of town, representing 25 different states and four foreign countries. One of those out-of-town runners was Solomon Kandie, a Kenyan training in Albuquerque, New Mexico. Kandie ran with the leaders for the first mile or two, the parts of the course on the FSU campus. Soon after that he broke away, building up a gap of almost two minutes by the eight-mile mark. Kandie continued to run away from the field for a while, leading by 2:42 at halfway. He was over three minutes ahead at 19 miles, but something had changed. Kandie was looking back. He was starting to slow down. Behind Kandie, Matt Flaherty was not slowing down. Running in the second position, Chicago’s Flaherty had passed the eight-mile mark chatting with third-place runner Justin Gillette. After Gillette dropped back, Flaherty exchanged friendly words with anyone he met along the course. He was running relaxed and he was maintaining his pace. So when Kandie slowed, Flaherty began to close in. Over the last seven miles, Flaherty cut Kandie’s lead in half, but he couldn’t catch the runner from Nairobi. Kandie won the marathon in 2:27:23, followed by Flaherty in 2:28:59. Gillette was third across the finish line on FSU’s Mike Long Track in 2:36:01. In 2011 FSU track coach Karen Harvey posted the fastest women’s time ever in the Tallahassee Marathon, running 2:43:33. Just a year later Leah Thorvilson turned Harvey’s time into the second fastest, winning the women’s division in an event-record 2:40:06, placing fifth overall. It was just three weeks after Thorvilson had run a 2:42:09 in the U.S. Olympic Trials Marathon in Houston, Texas. Thorvilson finished over three miles ahead of the second-place women, Melissa Gillette, 18th in 3:04:38. 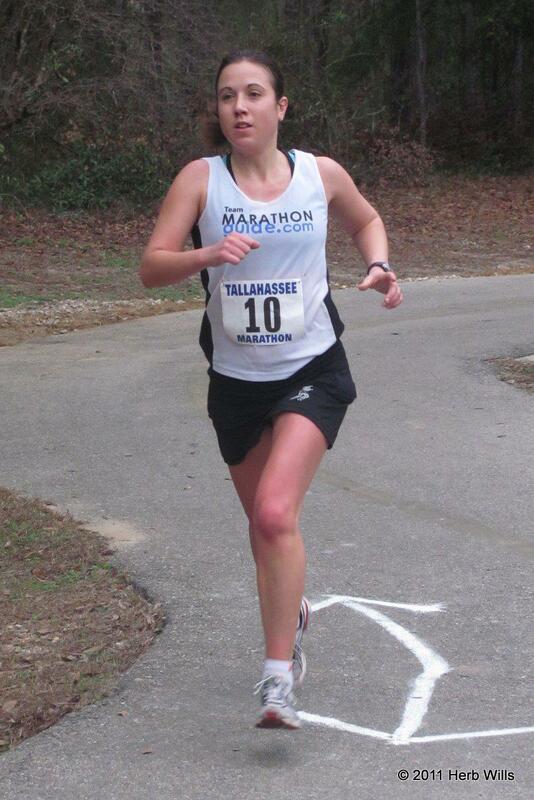 Tallahassee runner Katie Showman was the third woman finisher, running 3:16:51. Another 608 athletes finished the half marathon, swelling the crowd on the course. Crawfordville’s Stanley Linton was the fastest in the 13.1 mile race, running 1:15:31. Nearly half a mile back, Tampa’s John Robida outkicked Kentucky master runner Randy McDowell for second, 1:18:21 to 1:18:24 Tallahassee triathlete Seeley Gutierrez was the top woman in the “short” race, finishing eighth overall in 1:27:09. For the third year in a row, a record number of runners finished both the marathon and the half marathon. If the race continues to grow, the state may have to widen the St. Marks Trail some more. "Vanegas wins and Harvey sets record at Tallahassee Marathon XXXVII"
"Big wins for Cheruiyot and Moras at the 36th annual Tallahassee Marathon"
Marianna, Florida distance runner Cedric Gillette took early command at the Dothan, Alabama 30th annual Hog Wild Run on January 28, ultimately winning the 15K race in 58:41. Over 700 meters back, Chris Neal of Pace, Florida finished as the runner up and top master in 60:37. Dothan's Dana Cody took the women's title for the second straight year, placing eighth overall in 66:22. 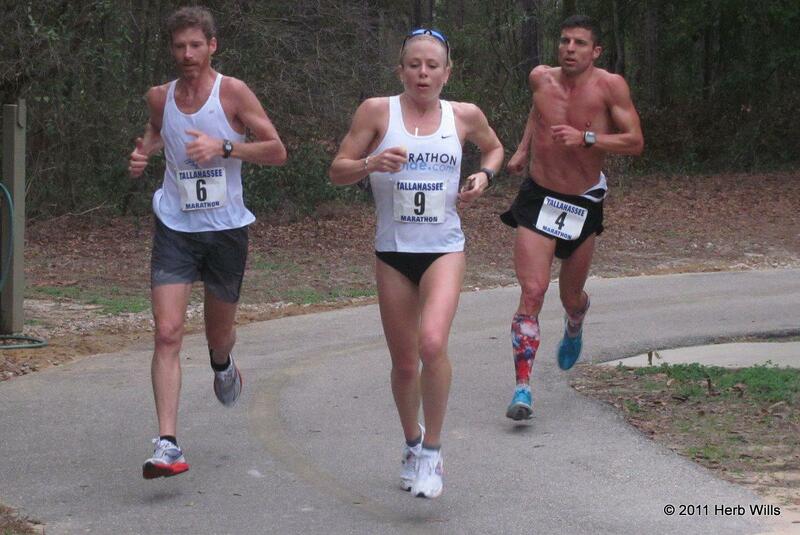 Michelle Underwood of Niceville was the second woman finisher and the first woman master, 13th in 66:58. Over 200 athletes completed the 9.3-mile race. It was not quite hot enough on the road to fry bacon when the race began on Saturday afternoon, but it was warmer than you'd expect for January, even in south Alabama. The start was delayed beyond the scheduled time of 2:00pm, but eventually the command was given, and over 500 athletes in the 15K and the 5K set off from the front of the Wiregrass Museum of Art on Museum Avenue. Before the end of the first kilometer, Cedric Gillette was ahead of all of them. After five kilometers Gillette's lead was up to 200 meters and still growing. His nearest pursuers at that point were Chris Neal and Dothan Northview High distance runner Justin Cagle. Gillette ran away to win in 58:41, while Neal dropped Cagle to take second in 60:37. Bainbridge, Georgia master runner Greg Waddell caught Cagle to take third in 62:04, while Cagle hung on to place fourth in 63:46. Dothan's Dana Cody successfully defended her 2011 Hog Wild 15K women's title with a 66:22, improving almost three minutes on her time in the 2011 race. However, Cody wasn't the only athlete in the women's competition to beat the 2011 winning time of 69:12. Not far back, runner-up Michelle Underwood crossed the line in 66:58, and third-place woman Megan Howell put up a 68:14, placing 16th overall. Tallahassee master runner Brian Hickey edged out Dothan schoolboy Michael "M.J." Houston for the top spot in the 5K race at Hog Wild, 20:19 to 20:28. Regina Fritz of Ozark, Alabama enjoyed a larger margin of victory in the women's division, placing fourth overall in 20:51. The women's runner-up, master runner Missy Sexton, was over 200 meters back in 22:01.